When General Contractors come to our office to discuss acquiring an Orange County, CA General Liability policy, many of them say “We have no employees, and I sub everything out; so shouldn’t the premium be lower?” In many instances, this is the case, but when we discuss the finer points of just what a sub-contractor is, and what the GC needs to do to stay in compliance, it becomes quite a different story. Usually, what we hear from the GC is “We will just 1099 them, so that makes them a sub-contractor, right?” This is most definitely not the case. The very first action a GC should take if they are going to use sub-contractors is to have their company listed as an additional insured on the sub’s General Liability Insurance policy–no exceptions on this one! Also, the GC needs to make sure that the sub has workers compensation insurance as well. We also inform our clients that, in today’s market, more carriers are including an exclusion in their General Liability policies for independent contractors, which means for our GC’s if they hired an independent contractor with no Liability Insurance coverage and on the off-chance their work should lead to a claim, there is a very real possibility that the GC’s policy will not cover this claim. Another area where your business could be at risk is if an independent contractor gets hurt working on your project, and it is deemed his status is that of an employee instead of an independent contractor, your company could be held liable for his medical costs as well as any fines or penalties. In this instance, there was a situation that was caused by this sub, which led to some severe damage to the house. In fact, the claim will more than likely be in excess of $75,000. When the GC asked for the name of the sub’s insurance agent and carrier, he had quite a shock. Not only did the sub-contractor have no insurance, he didn’t even have a license. The insurance policy that this particular General Contractor has specifically excludes this type of work, and now this huge claim is threatening to shut his business down completely. When we sit down with our General Contractors who are clients, we emphasize two items: first, never use a sub-contractor with limits lower than your current insurance policies, and, second, before the project starts, make sure the sub issues you a certificate of insurance naming the GC as additional insured, that their coverage is current, and make sure that there are no exclusions in the sub’s policy that could harm our client or put him at risk. Let us give you an example: say you hired a roofer to do a repair job, and the roofer decided to do torch-down, and the unthinkable happens–a small spark turns into a fire which causes severe damage to the house, and, afterwards, you find out that the sub’s California roofer insurance policy does not cover them for any hot, including torch-down. 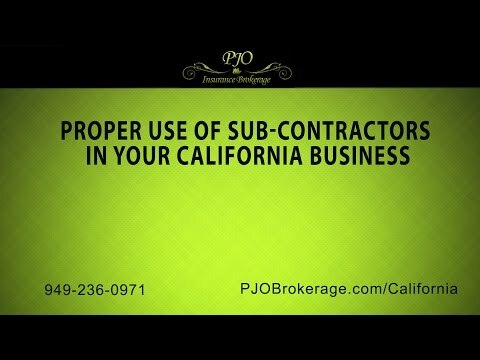 We highly recommend that one of the first actions that a client takes is to sit down with a professional and experienced California business insurance broker to review how they are using their sub-contractors and to confirm they are covered. If you would like to sit down and discuss this in greater detail, we, at PJO Insurance Brokerage in Orange County, would welcome that opportunity.